Screenworks member, Annie Benzie recently attended the Screen Queensland Drone Masterclass and provided the following article about her attendance. Screen Queensland recently hosted a Drone Masterclass (or Remote Piloted Aircraft Systems, if you prefer) at the Broadbeach Surf Club, supported by the Australian Cinematographers Society with Panavision kindly donating their cameras for a visual demonstration. The aim was to increase awareness of the responsibilities and regulations relating to the use of drones in the Australian film industry. The increasing use of drones as camera movement tools has outstripped the development of the regulations and protocols surrounding their usage resulting in a number of accidents. As virtual reality image capture becomes a reality and the consequent use of drones increases, it is imperative that this situation is addressed. Gina Black from Screen Queensland, who put together this Masterclass introduced Stephen Oh from XM2 Aerial and Carl Brand from the Civil Aviation Safety Authority (CASA), and both gave presentations to an audience consisting mainly of producers, Unmanned Aerial Vehicle (UAV) operators, cinematographers and safety officers. It was followed by a demonstration flight and Q & A.
Stephen Oh shared his vast experience in drone cinematography, his company having been involved in productions such as Pirates of the Caribbean 5, The Dressmaker, Blue Dog and David Attenborough’s The Reef. Stunning examples of drone footage from The Reef provided a riveting opening for Stephen’s presentation as he explained the challenges involved in making slow movements with a drone. Being able to execute long, low, straight moves without the requirement of a fixed mounting point is the main advantage of the drone over other camera movement devices. He related the experience from Pirates of having 3 weeks to develop a drone to support an Alexa XTM resulting in a 40kg machine as opposed to the 25kg machine they were proposing to use with the RED Epic. A number of different applications for use of the drone were outlined including having two cameras mounted with different focal length lenses, necessitating one pilot and two camera operators, as a way to capitalize on the one setup. A drone may not exceed a height of 120metres (400ft) due to 150metres(500ft) being the minimum height an aircraft can fly at. It is however possible to apply for exemptions from some of these rules if necessary. Stephen’s main advice for the aspiring UAV operator was to take the time to gain experience and not to be too keen to step up quickly. Time taken to develop the particular skills required helps gain the confidence to say no when something is too risky. He impressed upon us the need to stick to the original flight plan and if things change to land and make sure everyone is aware of the change despite the producer’s cry of ‘time is money’. The pilot always has the overriding authority to call a stop to the shot. Camera operators and pilots need to develop a rapport and it is the camera operator who translates instructions from the director to the pilot. The presentation was bought to a close with Stephen outlining the importance of insurance. UAV operator’s need to take out their own insurance, they will not be covered by the normal production insurance, 3rd party insurance does not cover any accidents relating to the drone on the ground, hangar keepers insurance is required for this. The UAV operator also needs to take out payload insurance for the camera as the usual equipment insurance does not apply. The operator needs to be CASA qualified and have gained permission to execute the flight plan from CASA or insurance will be void. CASA’s representative, Carl Brand, began by talking about his background flying the Scaneagle, a fixed wing UAV, for the airforce. He admitted that take up of UAV’s and developments in technology have grown at a great rate and the regulations have not necessarily kept up. Australia is the first country to regulate RPAS, and the regulations, which were developed in1998, are now under review with an update due to be announced in September. He then went on to outline two main training paths for prospective UAV operators. The first option is to do a CASA approved Controller’s Certificate through a registered training organization, the second was to do an aviation exam through a flying school after studying private pilot theory. This was followed by a demonstration flight by the XM2 team’s 40kg drone carrying a RED Epic with a 50mm lens. Stephen gave the observers a safety briefing before moving outside the main points being to stay away from the drone once it was operating and on takeoff and landing to keep your eyes on it. The team consisted of a pilot, camera operator, technician and spotter. Despite an estimated wind speed of 30kms/hr the shot was beautifully stable and the drone appeared to be very responsive and maneuverable. Stephen Oh explained that the team goes on set with replacements for every component, that producers need to be aware of the set up time required and that there are, obviously, great benefits in including them on the tech recce. The main concerns voiced in the Q and A were about how policing the general public around operating drones was challenging and regulating hobbyists was impossible. 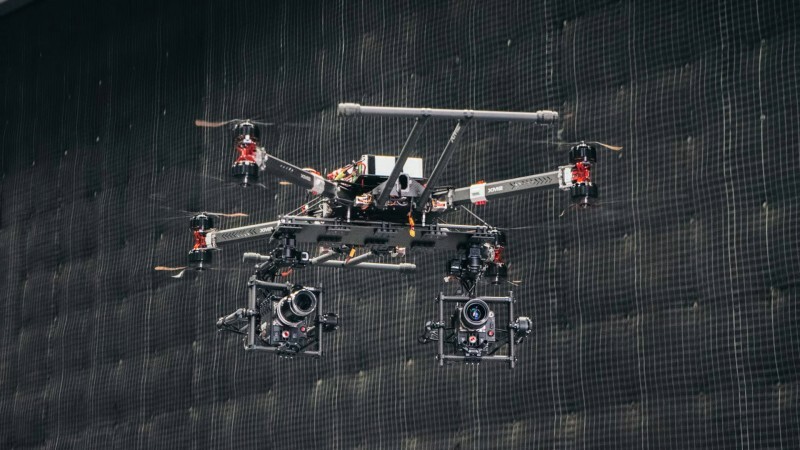 Safety around RPAS operations seems to be the area that needs the most attention as the industry adjusts to the incorporation of this new tool in the filmmaker’s image capturing arsenal. Thanks to Gina Black and her team at Screen Queensland for providing this informative and thought provoking session.